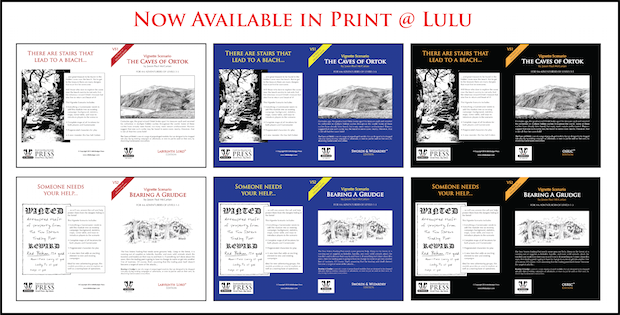 You can now purchase VS1: The Caves of Ortok and VS2: Bearing a Grudge in print at our store at Lulu. To celebrate the release of the print versions of our Vignette Scenarios, we’re offering a special 20% introductory discount at Lulu through Feb 8, 2015. Books purchased there qualify for our Digital+ Program (see below). You can also save 33% on digital only versions of our products at both DriveThruRPG and RPGNow. To accommodate current and future plans for print and PDF products, as well as our Digital+ Program, our pricing has changed on some products to fall into line with the standard pricing that much of the rest of the industry follows, with our digital products costing 50% of the print equivalent. This was a difficult decision to make, but pricing products requires balancing their competitiveness in the market, the value to the creator and consumer, and the ability to support the publisher. InfiniBadger Press is proud to announce our Digital+ Program, which is designed to enhance our print products as well as make our products accessible to those who are traditionally unable to take full advantage of physical products. Part of our long-term goal is to offering our content in as many formats as possible so that you, the end user can end up having access to the content and be able to manipulate it as you see fit. This program is inspired by people like Cory Doctorow, as well as the need for open access to content for those who are disabled and need alternatives to media consumption.